How a community water system shares the gospel. Pastor Pablo and Dina Peña, along with members of their church, have partnered with HOPE Coffee for several years to share the gospel in their local community of Yoro, Honduras. This past May the church built a community water storage unit (Pila) to help those who didn’t have easy access to water. Through this process, and several other pilas that were built late last year, four people are attending Bible studies to learn about the gospel! Please pray for Tina Zarmiento, pictured above on the left with Pastor Pablo, to trust in Jesus – the Living Water. She has trouble walking due to an ulcer in one leg. The water storage unit (pila) that she received last November through the partnership of the church and HOPE Coffee has opened the door for the gospel this year as the church leaders meet with her and her two nieces for a regular Bible study. 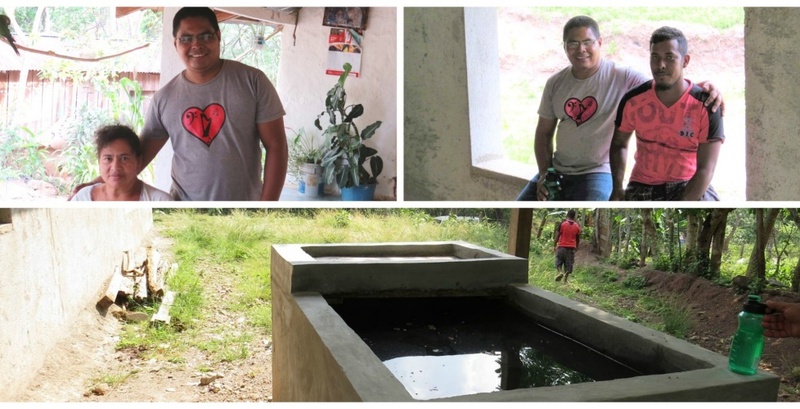 Marcio, pictured above on the right with Pastor Pablo, is another young man in the community who has benefited from the community water storage unit. Pray for him to understand how Jesus is his Savior as he meets with Pastor Pablo to study the Bible and learn about the gospel. Thank you for drinking HOPE Coffee and helping us share the gospel!